Three new Windows 8-based Acer machines are now available in the Indian market, including the recently demo'd Iconia W3, the first 8-inch Windows tablet. 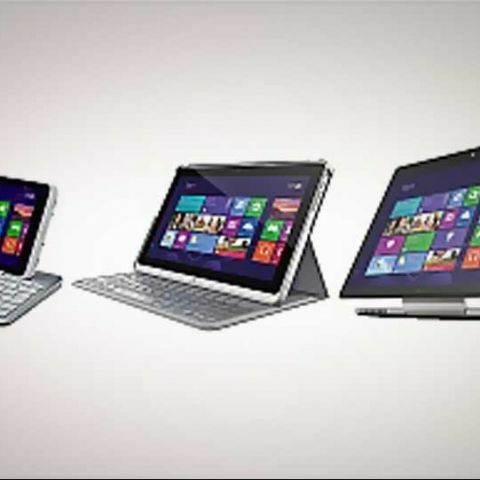 Acer India has launched three new touch-enabled Windows 8 devices in the country – a laptop (Acer Aspire R7), a tablet (Acer Iconia W3), and an ultrabook (Acer Aspire P3). According to Acer, the ‘new line of mobile products’ will shape the company’s focus on ‘redefining the computing experience through progressive design’. The Acer Iconia W3 is an 8.1-inch (1280x800 pixel) Windows 8 (32-bit) tablet that is 11.35mm thick, and weighs in at 540 grams. It is powered by a dual-core 1.8GHz Intel Atom Z2760 Clover Trail processor, coupled with 2GB of RAM. It has 2MP cameras in the front and back. Other features of the Iconia W3 include Wi-Fi 802.11 b/g/n connectivity, Bluetooth 4.0, microSD card storage up to 32GB, as well as microHDMI and microUSB ports. Acer has quoted an estimated battery life of 8 hours. The 32GB model of the Iconia W3 is available at Rs. 30,499, though it has a special introductory price (till July) of Rs. 27,999. The Iconia W3 interestingly also comes pre-installed with Microsoft Office Home 2013, with access to Excel, OneNote, PowerPoint and Word. It also features an optional Bluetooth keyboard that’s large enough for a 13.3-inch notebook. The Acer Aspire P3 Ultrabook is a Windows 8 (64-bit) laptop-tablet hybrid, which features a detachable keyboard. Its 11.6-inch IPS LCD display features a resolution of 1366x768 pixels. It comes with up to a dual-core Intel Core i5 processor (i5-3339Y) and 4GB of DDR3 RAM. It weighs in at 1.3 kilograms, and is 19.5mm thing including the keyboard. In terms of connectivity, it features Wi-Fi 802.11 a/b/g/n, Bluetooth 4.0, USB 3.0 port, and HDMI-out. It also features an integrated webcam and microphone, and according to Acer, will deliver a 6 hour battery life. It will be available with a 120GB SSD, at a starting price of Rs. 54,999 (special introductory price of Rs. 49,999). The Acer Aspire R7 Windows 8 (64-bit) notebook is meant to be a desktop replacement laptop-tablet hybrid, and features a 15.6-inch Full HD 1920x1080 pixel LED-backlit touchscreen. The Aspire R7 also features what Acer calls a ‘revolutionary Ezel hinge,’ which moves the display forward and into four different positions (notebook, tablet, display, or Ezel mode for the screen to float over the keyboard at various angles). The Aspire R7 is powered by the 1.8GHz dual-core Intel Core i5-3337U processor, coupled with 6GB of DDR3 RAM (up to 12GB possible). It features a 500GB conventional hard-drive, coupled with a 24GB SSD for caching. It also features Dolby Digital Plus Home Theater audio enhancement, an HD webcam, an Acer ZoomPerfect touchpad, Bluetooth 4.0 and Wi-Fi 802.11 a/b/g/n connectivity, HDMI-out, 1xUSB 2.0 ports, 2xUSB 3.0 ports, a SD card reader, and a 4-cell battery rated to deliver up to 4 hours of backup. The Aspire R7 will be available from Rs. 74,999 (special introductory price of Rs. 69,999). Anybody know whose servicing is best ?